MOSCOW: Aliou Cisse, the Senegal coach’s confidence was not misplaced. 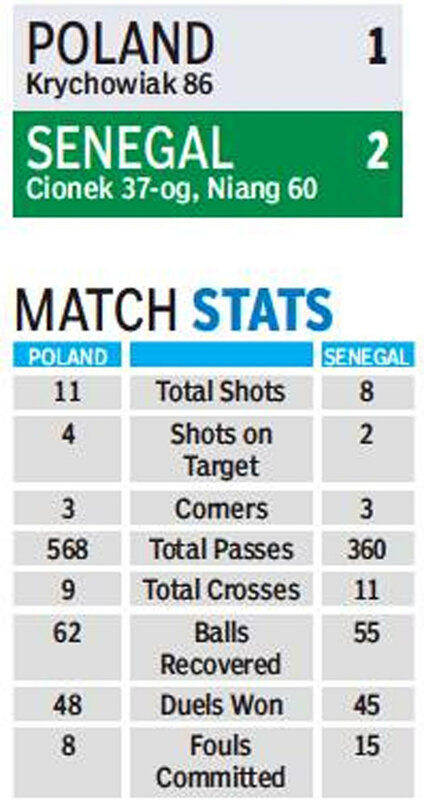 Senegal made a statement of intent getting the better of much-hyped Poland 2-1 in their first encounter of the World Cup on Tuesday. Bristling with pace and force, the Senegalese imposed themselves on the game before Robert Lewandowski’s Poland could shake off their slumber. By the time, Lewandowski made the first run down the middle, it was already midway through the second session (72nd) and they were already trailing 2-0. Thiago Cianek’s own goal and Mbaye Niang’s insurance indicated that Senegal were actually the best African side, that coach Cisse had claimed a day earlier. Grzegorz Krychowiak’s headed consolation resulting from a Kamil Grosicki freekick, four minutes from time, was a glaring pointer to Poland’s fateful desertion of the long ball for a fancier style. Earlier, Polish fans had almost taken over Moscow. Visiting next door is easy and they came in hordes wearing their white and bright red dresses raising the decibel level in and around the Spartak Stadium on Tuesday. Only two corners of the arena were inhabited by a handful of Senegal fans but their voice and drums were creating enough noise to support the Lions on the pitch. Off to a soporific start, one kept questioning how Poland topped their qualification group and Lewandowski finished with 16 goals. Jakub Blaszczykowski struggled from the start on the right as Krychowiak looked a complete antithesis of Xavi Hernandez or Andre Pirlo, the players who made central midfield the fountainhead of all creativity. Not only is Krychowiak built like a bulldozer, he moved like one too and Sadio Mane, Mbaye Niang and Idrissa Gueye enjoyed miles of space once they completed the simple task of slipping past the Poland man. Slow in movement and imagination, the Polish defence was given a torrid time by Rennes winger Ismaila Sarr. As the game warmed up after the half-hour mark, perhaps after Aliou Cisse’s insistence whose experienced eye read the intrinsic limitations of the Poles, Sarr started making those sub-10 dashes down the right. Pressure was building and the breakthrough for the lions of Teranga came soon after, albeit with a bit of luck. Niang sprinted past Michal Pazdan down the left and lay the ball to skipper Sadio Mane. The Liverpool striker in turn pushed it across for Gueye whose low drive took a deflection off defender Thiago Cionek, wrong-footing Wojciech Szczesny and rolled agonizingly into the net. Poland tried to inject some pace in the second session but defensive calamity hit them on the hour mark. Krychowiak took leave of his sanity and went for a 40-yard back pass. All hell broke loose, or may be comedy of errors, if you are a Senegal fan. The pass dropped short of the goalkeeper and substitute Jan Bednarek tried to recover only after a confused few seconds. It was enough for Niang to continue his run and complete the simple task of putting the ball into an empty net.